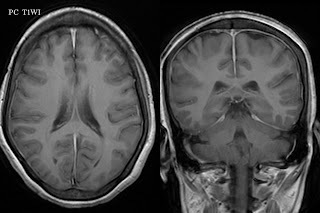 A 40 yo female with moderate continuous headache not responding to anelgesics. Neurological examination normal. Advised CT study of Brain. Plain CT study of Brain shows hyper density along inter hemispheric fissure and tentorium. MRI study of brain Axial Post contrast SPGR T1 w images show dural thickening along inter hemispheric fissure and tenotorium. No significant signal abnormality in rest of the brain parenchyma. MR Venogram of Brain normal. Imaging wise : Idiopathic Hypertrophic Patchymeningitis. Pt is responding to steroids. Syn : Dural pseudotumor, Idiopathic cranial hypertrophic pachymeningitis (ICHP) is diffuse dural thickening without known etiology like neoplasm or infection. Imaging wise best diagnostic clue is thickened enhancing meninges "turn the corner" under temporal lobes in continuous line from vertex on coronal sections. CT often normal. May show hyper density along inter hemispheric dura and tentorial leaflets. Brain parenchyma show normal attenuation pattern. MRI is the investigation of choice, shows dural thickening often bilateral follows inner calvarium, extends along falx, tentorium may extend into lACs, along spinal cord with enhancement on post contrast T1w. Dural thickening has to be more than 2 mm, may be more than 1 cm. Usually smooth, linear, diffusely thickened dura. Less commonly nodular, focal soft tissue mass like lesions. 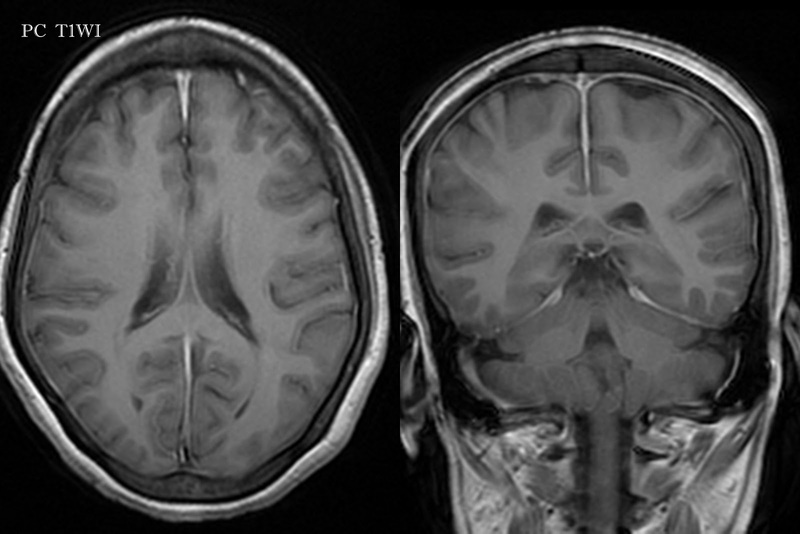 Signals on MRI are often iso to hyper intense on T2w images. In cases of densely fibrosing pseudotumor may appear profoundly hypointense. Invasive variety may show encroachment of dural venous sinus with abnormal MR Venogram, dural venous sinuses showing poor flow related signals. - Infection (TB, HTLV- 1, indolent infections such as pseudomonas, syphilis, rhinoscleroma, fungal. No bacteria, fungi, neoplastic cells. - Discontinuous, most prominent at convexity, less intense than cavernous sinus. - Lymphoma often associated with systemic disease. - TB is meningitis lepto meningeal pattern of involvement is more common than patchy meningeal involvement. - Associated finding are sagging midbrain on sagittal sections with tonsillar herniation. Any age; peak 3rd-5th decades. Most common complaint is Headache. Cranial neuropathy: Progressive sensorineural hearing loss, hoarseness, optic neuropathy, Tolosa-Hunt syndrome. Some are benign, require no treatment. Specific diagnosis may require biopsy.